Newsletters can be a major frustration for churches. Oftentimes members want them, but church staffs don’t always have time to create the content for them. Plus they can become dumping grounds of information. Westbury United Methodist Church, a 350-person congregation in Houston, Texas, found themselves in that situation and believed there had to be something better. 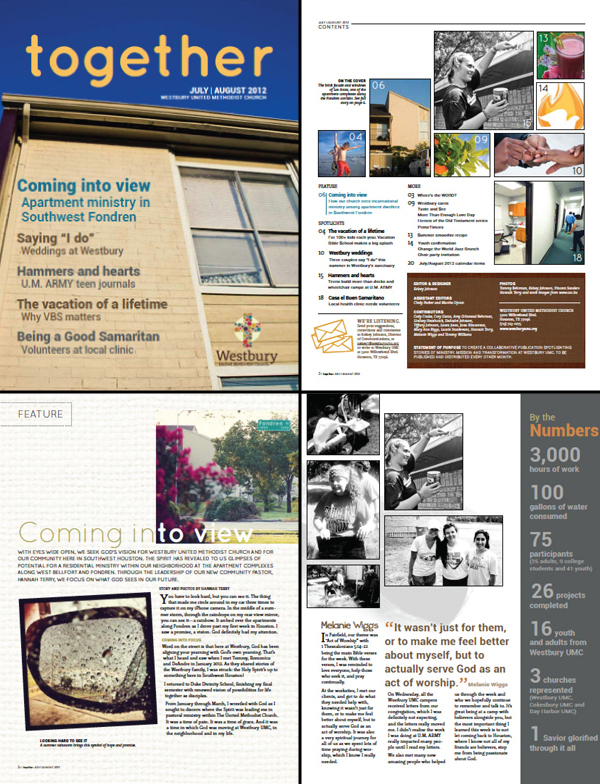 Knowing that their congregation still needed to rely on paper more than technology, Westbuy decided to ditch the monthly black and white newsletter and launched a full-color magazine published 6 times a year. Gone was the long letter from the pastor and articles written by staff. The top down broadcast of information was out the door, too. Now the magazine was collaborative relying more on the congregation finding and telling each others stories. Besides being collaborative, the new magazine does a lot of other things, too. It’s erases some of the duplication of information that happened with trying to fill a monthly newsletter. There’s more color on the page. And now there are more stories of the life change happening in the church. “The vibrant photographs, first-hand stories, pull quotes, sidebars, graphics and stats synchronized to really enliven the publication and make it more interesting to read and appealing to share with friends and neighbors,” says Johnson. That dramatic format change won over our judges. Overall, the response was mainly positive. The main complaint was people wanting it every month. To fill that need, Westbury pushed people to their weekly email that had a more detailed list of what’s going on in the church. So what’s next for Westbury? They plan on using their $2000 grant to put up TV’s around the building that can show slides of important announcements. Want to know more about this project? Check out Westbury’s application video. Congratulations on the transformation of your newsletter into a magazine format. It looks great. Congratulations on your award, too. We have begun to move toward a more magazine like feel in our newsletter. I have taken the traditional Pastor’s lead off the front page, and replaced with a photo or other image. Our members now say they keep the newsletter all month, because of its attractive cover. They also say they are more likely to flip through it more than once. I think we made a good start. But we are still bound to the old content of what’s coming this month, and what happened last month. We also are limited to black and white for the inside pages, due to costs. I can see where a bi-monthly format could over come the cost issue. Stories and observations are few and far between from my readers. I would love to learn how you got to the collaborative model, and how long it took you to find authors. Also, what program do you use to do your layout and formatting?